We can keep your engine running happily and at peak efficiency. Don't neglect your vehicle's electronic systems! Auto Air & Electric of Lee County Inc Offers Auto Repair Services You Can Count On! 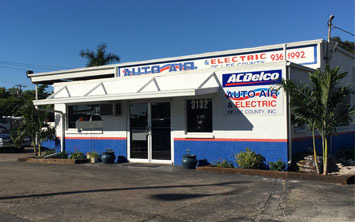 Since 1992, Auto Air & Electric of Lee County Inc has provided motorists in the Fort Myers, FL 33901 area with comprehensive auto repair services that include 4x4 Services, Brakes, Car & Truck Care, Domestic Cars & Trucks, Electric and Hybrid Vehicle , Electrical Services, Electronic Services, Engine & Transmission, Engine Maintenance, General Services, Heating and Cooling Services, Ignition Interlock Systems , Import Cars & Trucks, Inspections and Emissions, Miscellaneous Services, Quick Lube Services, Tires, Towing and Undercar Services. Our goal is to offer the best services available at affordable prices to get you back on the road in no time. For a high-performing vehicle, trust Auto Air & Electric of Lee County Inc with your car, truck, or van. To learn more about the services we offer, please contact us by phone at 239-936-1992 or send us an email. We also invite you to learn more about our dedication to you, our valued customer. It took me over 10 years to find an honest and knowledgeable auto repair shop. Don Weiss is over 15 miles from my home but worth the trip every time. I had a leaky rack and pinion on a 04 Toyota convertible. It was over $900. Don thought replacing it would serve me best but he said I could try a "stop leak" additive for $25 and see what happens. It's been over 3 years and still no leak. I have total trust in Don and his shop. Always honest, fair and knowledgeable. Have been taking autos there for over 20 years and will continue to do so. Adjacent to Lee Co Trans & West Coast Wheel, tow more of the same caliber! Don and his team do amazing work and he's very fair and honest. Long, long time customer. They are the finest in the county for troubleshooting problems. Don was excellent. Truck fixed like it should be and the costs were more than fair. Thanks! Don and his staff are excellent with customer service and quality. Recommend them highly and glad I found them. Our first experience with Auto Air and Electric was back in 1998 when the AC in my wife's Mercury Cougar failed. We had been recommended to them by Lee County Transmissions as honest, knowledgeable and fair. We took the car in and at the time they had given us a couple of options: One was to do a quick fix and one to do a much more thorough fix. We opted for the complete fix that basically rebuilt our compressor. When we got the car back we had the coldest air we had ever had and continued to enjoy the AC until we sold the car. Through the years we have continued to have all of our vehicles serviced by Don and his team from AC, brakes, wheel bearings, electrical, four wheel drive axles and the list goes on. They are honest, knowledgeable, helpful and fair and from what I have seen capable to fix any auto issue. This and west coast wheel alignment are the most honest businesses you'll find in Lee county, and they're both on Fowler street! Both shops have professionals, they're fair, honest, and a pleasure to deal with! Consummate professionals! Excellent service! I've sent many folks to these shops and I always get positive feedback, not one complaint in years! Try them, you'll love the experience, and become a customer for life! There's no beating courteous service, with professionalism to boot!